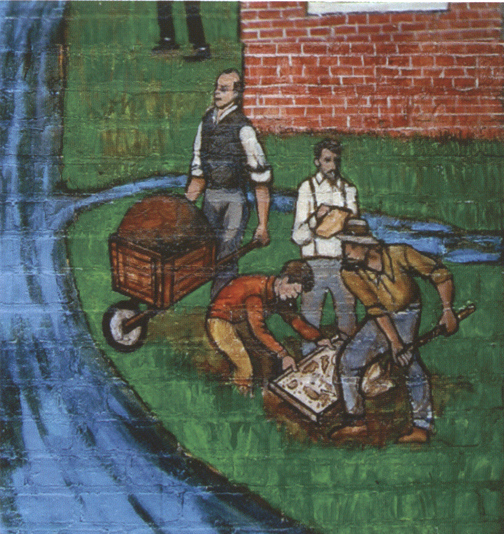 In 2005 EBSCO Publishing commissioned artist Alan Pearsall to paint a 2,700-square-foot mural on one of the old mill buildings occupied by the company in Ipswich. 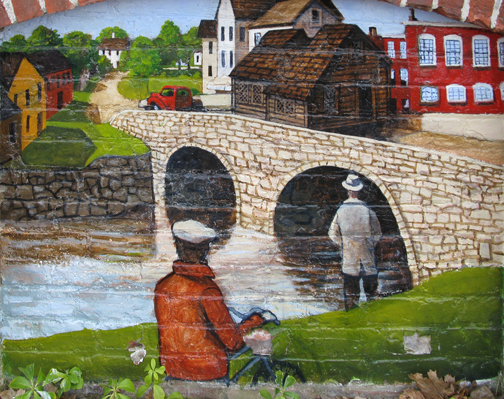 The mural is the centerpiece of the town’s new Riverwalk. 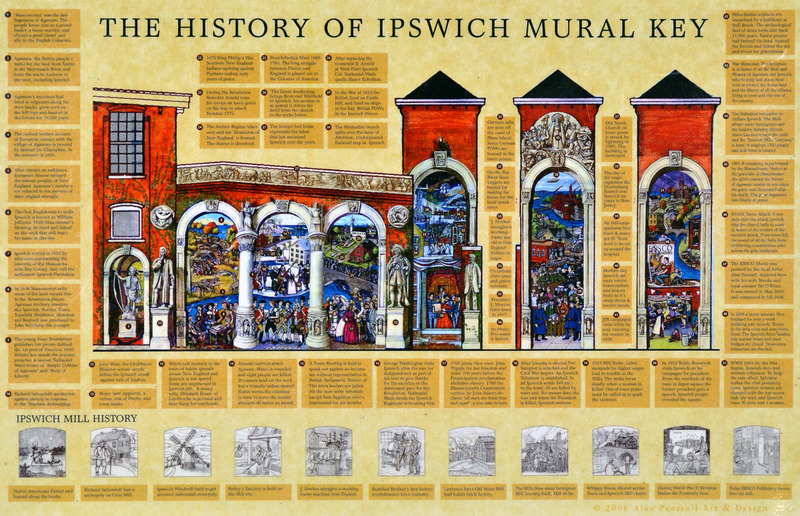 Alan based the mural on the history of Ipswich from the time of its settling to the current day, viewed chronologically from left to right. Click on the thumbnails below to view larger images. 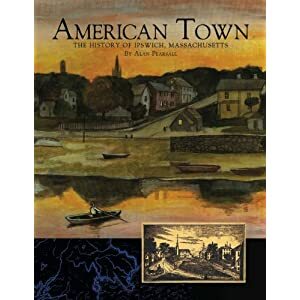 Alan Pearsall published American Town: The History of Ipswich Massachusetts based on his studies in preparation for each aspect of the Ipswich mural. 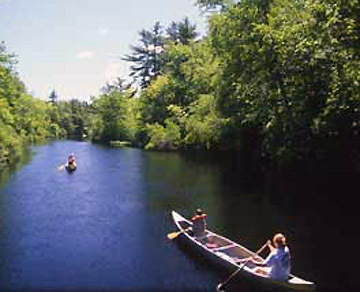 Agawam was the Native people’s name for the land from Salem to the Merrimack River and from the sea to Andover to the west, including Ipswich. Agawam’s inhabitants had lived in wigwams along the river banks, grew corn on the hilltops and hunted in the forests for thousands of years. 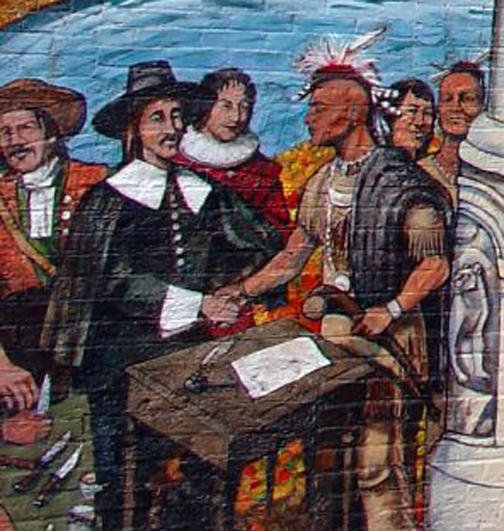 The Agawam people were members of the Penacook Federation, an alliance of the five Indian Nations of New England. 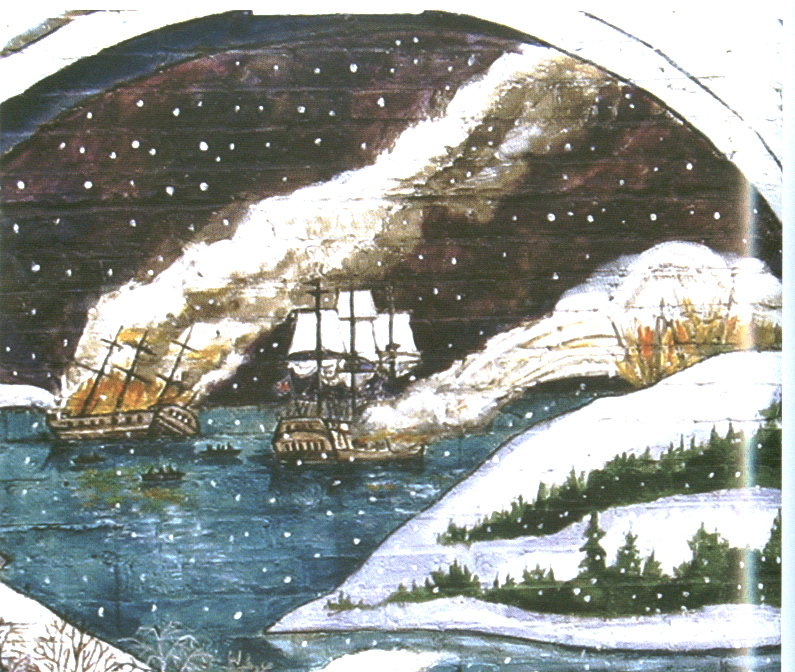 The image here shows the arrival of settlers’ ships. John Winthrop arrived with the first Europeans to establish a community here on “The Arabella” Masconomet Quinakonant was the last Sagamore (chief) of Agawam. His people knew him as a proud leader, a brave warrior, and elder statesman. He was always a good friend and ally to the English colonists. He lived in a long house on Hog Island (Choate Island) and is buried on Sagamore Hill in Hamilton. 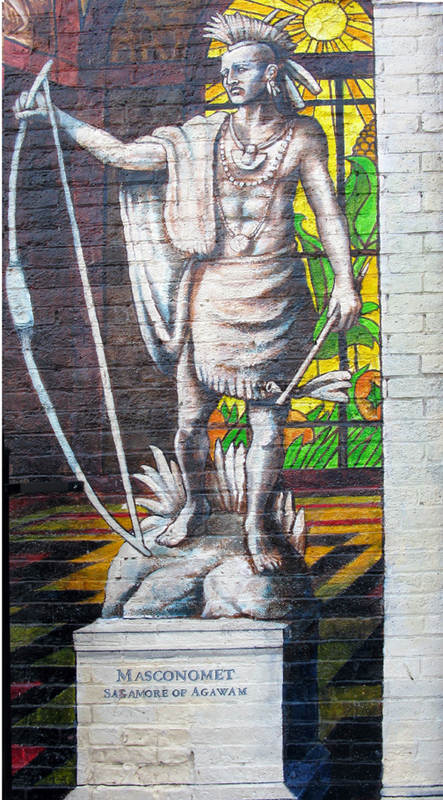 Sagamore Passachonaway “Son of the Bear” was a spiritual leader and the last great Eastern chief of the local Indians. Thousands of Indians attended his funeral in the White Mountains. In 1638 Sagamore Masconomet sold the territory of Agawam to John Winthrop the younger for £20. Most of the tribe had already died from a plague brought by contact with Europeans. 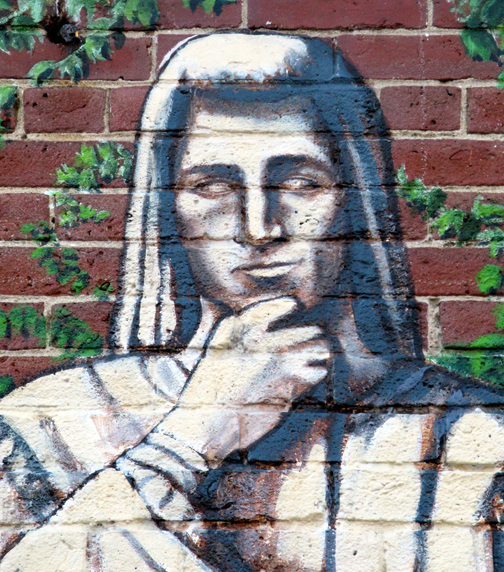 The land would eventually become the towns of Ipswich, Essex, Newbury, West Newbury, Newburyport, Topsfield, Boxford, Rowley, Hamilton, Wenham, Beverly, Middleton, Andover, Gloucester, Rockport, Annisquam, Bradford and Marblehead Anne Bradstreet is known as America’s first poet. In 1647, without her knowledge, a manuscript of her poetry was published in England under the title The Tenth Muse Lately Sprung Up In America, by a Gentlewoman in such Parts. 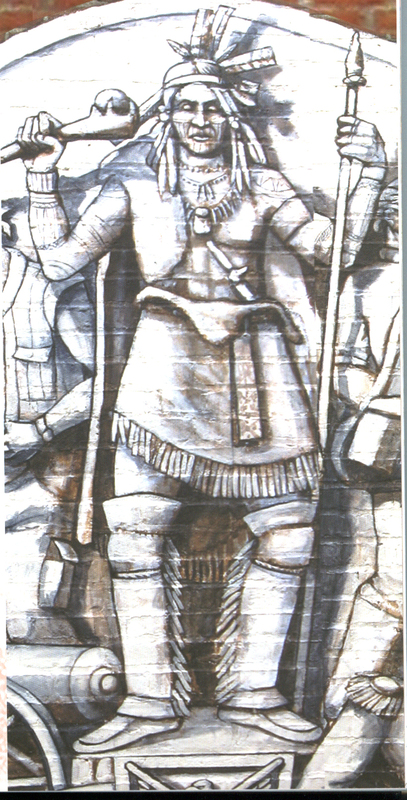 In 1675, the “King Philips War” was the last Indian uprising in New England. The war was marked by violence and cruelty from both sides. Many Ipswich men took part in this war of survival. 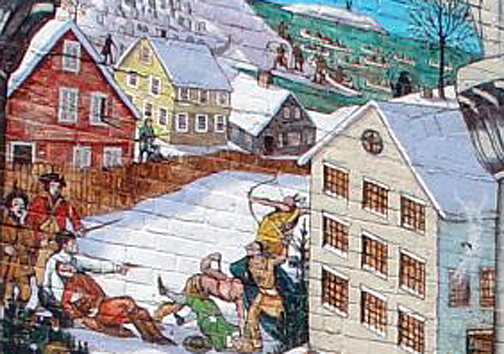 Major Samuel Appleton turns the tide of the war in the Connecticut Valley, and the colonists are victorious. 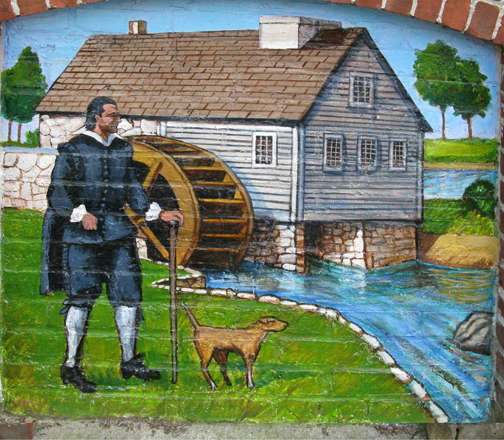 Richard Saltonstall built the town’s first mill on the Ipswich River near the site of the current EBSCO facilities. The Witchcraft hysteria that started in the Danvers section of Salem spread throughout the area. Some of the accused were imprisoned in the Ipswich jail. Ipswich resident Elizabeth Howe was tried and hung as a witch during the infamous Salem Witch Trials. The Perley family of Ipswich had a ten-year old daughter they claimed was being afflicted by Howe after the child complained of being pricked by pins and sometimes fell into fits. Elizabeth Howe, Rebecca Nurse, Sarah Good, Sarah Wildes and Susanna Martin were hanged on July 19, 1692, and buried in a crevice on Gallows hill in Salem. The Rev. 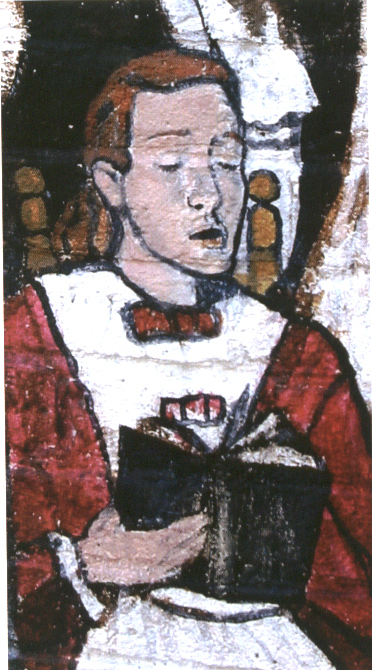 John Wise was the colonial minister in Chebacco, formerly a part of Ipswich that became Essex. He was an exponent of the democratic principles and ideas that shaped the Declaration of Independence. 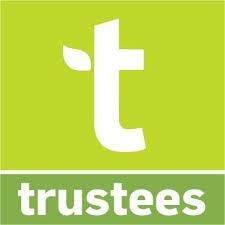 In 1689 a town meeting was held to petition against taxation without representation by the British Parliament. Several town leaders headed by John Wise were jailed by Royal Governor Sir Edmond Andros. Sam Appleton refused to sign an apology and remained imprisoned for six months. 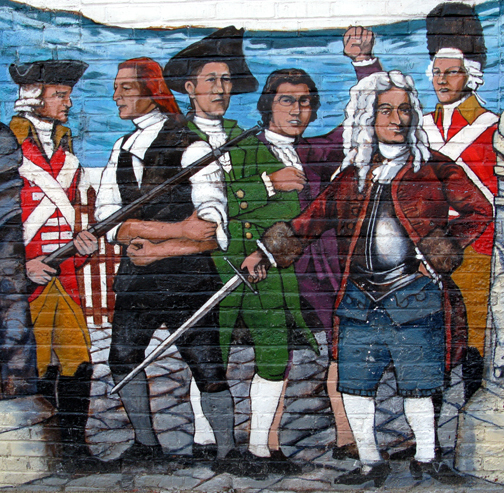 Because of this rebellion Ipswich is known as the Birthplace of American Independence. In 1740 the “Great Awakening” spread from Europe to the Americas. Evangelist George Whitefield famously drove the Devil to jump off the steeple of First Church. The Devil’s cloven hoof made an indentation in the rocks below, which can still be seen today. The long struggle between France and England between 1689 – 1763 is called the French and Indian Wars. 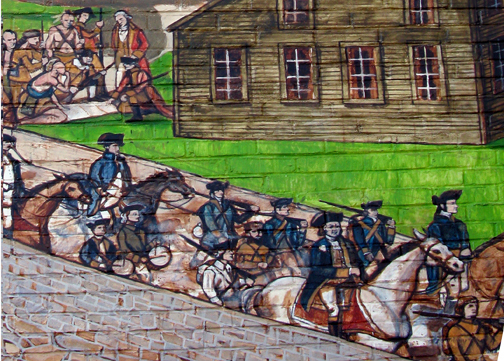 Local native Americans fought alongside Ipswich residents, while the French were able to draw on help from the Abenaki and other tribes hostile to the Massachusetts confederation .In the foreground are soldiers crossing the Choate Bridge led by Col. Benedict Arnold on their way to attack Montreal in 1775. 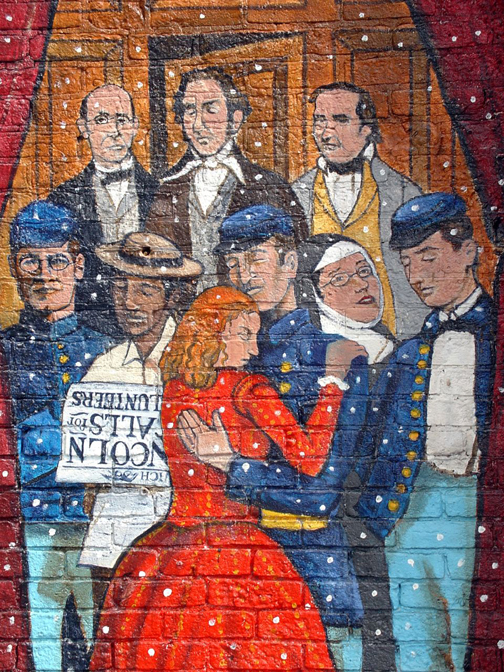 A young Aaron Burr was among the ranks, along with several Ipswich men. 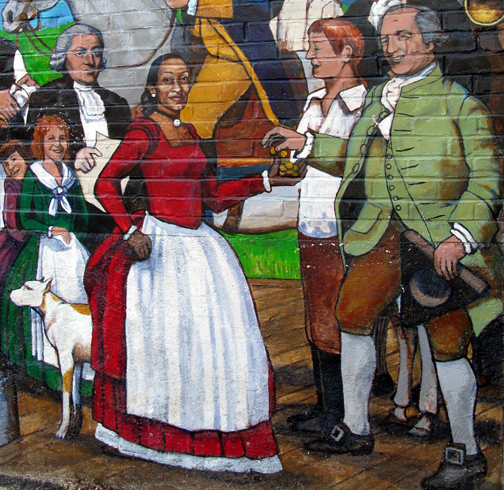 In 1765 slave Jenny Slew sued and won freedom from her master, John Whipple, who was also ordered to compensate Jenny for her past services. In 1780 the Massachusetts Constitution drafted by John Adams declared that ‘all men are born free and equal”, thus becoming the first state to outlaw slavery. Ipswich men gave their lives fighting the war for independence. 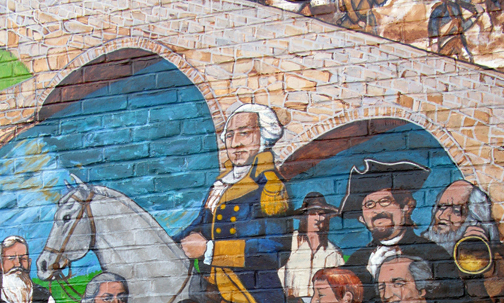 After the Revolution, the new president George Washington visited Ipswich. 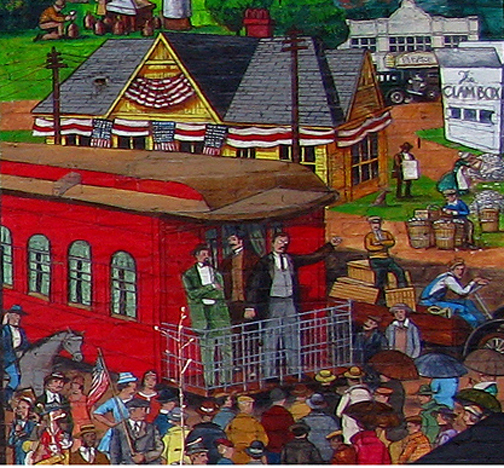 He is shown here at the South Green thanking the people of the town for their sacrifices. 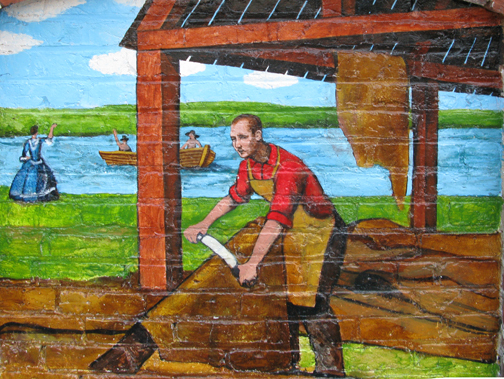 Leather tanning, shoe making and haberdashery were important early trades in Ipswich. In the early 1800’s Congress passed an embargo on all foreign goods to retaliate against acts by the English. 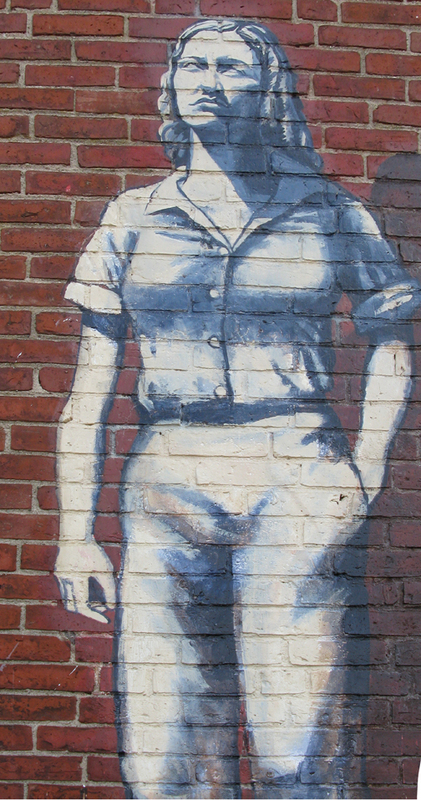 New England communities bitterly opposed the embargo, which was repealed when Madison was elected president. British ports refused American entry, and war was declared by President Madison on June 17, 1812. British ships fired at Castle Hill and Plum Island, and the embargo was reinstated. Hand-woven lace was an early industry in Ipswich. In 1822 an automated lace-weaving machine was smuggled from England to Watertown, then delivered to Ipswich. 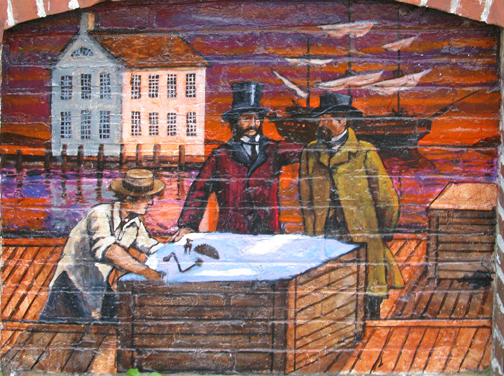 The Ipswich Manufacturing Company begin the production of hosiery in 1828 under the ownership of entrepreneur Dr. John Manning. Ipswich soldiers prepare to join the Civil War following the establishment of the Ipswich Volunteer Company. Of the 348 Ipswich men who went to the front, 54 died in the war. 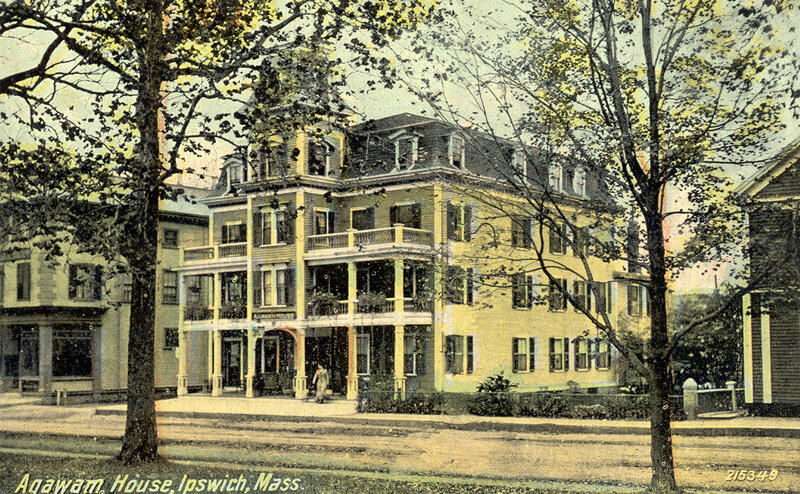 In 1868, Amos A. Lawrence established the Ipswich Hosiery Mills in the old stone mill on the Ipswich River. By the turn of the century, the enterprise had become the largest stocking mill in the country. 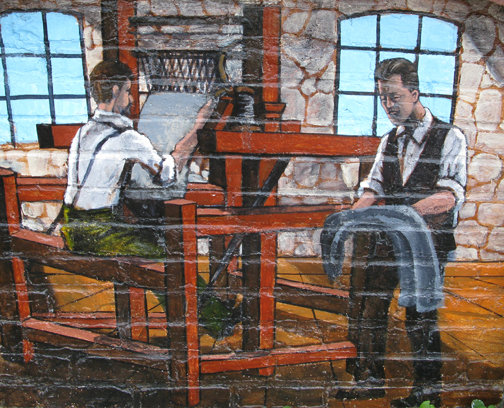 The industrial revolution brought greater and more diverse population to Ipswich as a result of its water-powered mill industries, including machine knitting. 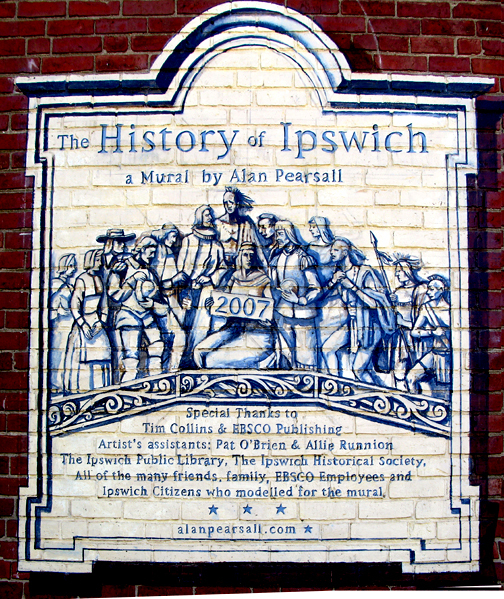 Descendants of the immigrants from England, Ireland, Canada, Poland and Greece who came to to work in the mills still live in Ipswich. James and Sanford Peatfield created new stocking frames and improved lace machines at the Boston and Ipswich Lace Company, which opened in 1823. They opened their own underwear manufacturing business near Depot Square, with the financial assistance of George Heard. 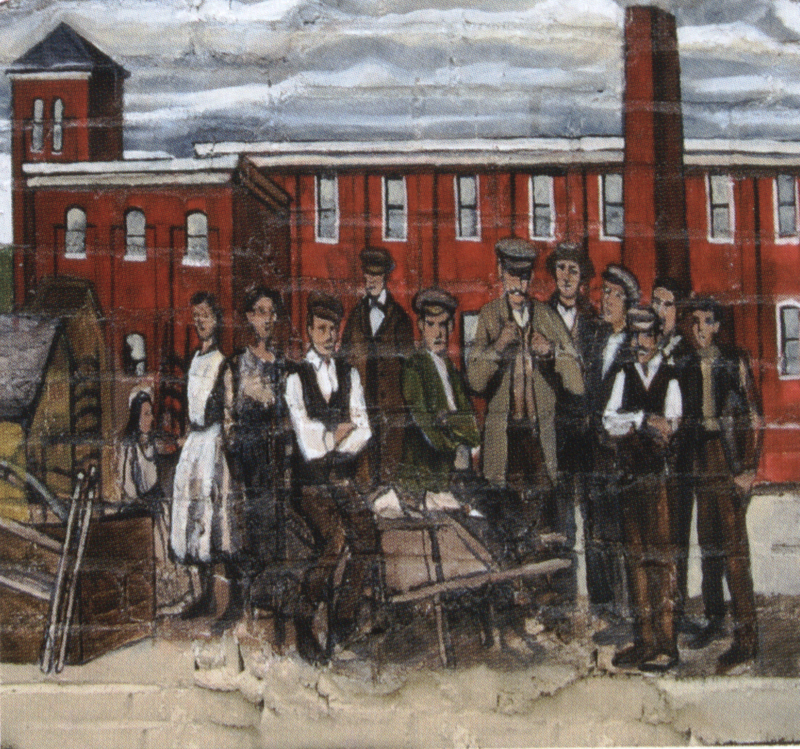 In 1913 labor demands led to a strike at the mills in Ipswich. Young Nicoletta Pandelopolu was killed by a stray bullet from the police, who were called up from neighboring towns to squelch the strike. After the strike Mill workers were fired from their jobs, evicted from their mill-owned homes, and kicked out into the streets with no place to go. In 1912, president Teddy Roosevelt’s “whistle-stop” presidential campaign tour passed through Ipswich. He delivered a speech in front of the train station to a local crowd. The Whipple House was moved across the Choate Bridge from its former location at the corner of Saltonstall and Market Streets to its permanent home on South Green. Many women worked in the mill during WWII manufacturing proximity fuses used in antiaircraft projectiles. This was one of the great secrets of World War II. The work that women did at this Sylvania factory in Ipswich was top-secret. The largest Paleo-Indian site in Massachusetts is the Bull Brook Site in Ipswich, where over 8,000 artifacts have been found at the intersection of Egypt River and Bull Brook.The excavation was in an area being worked for sand and gravel and was eventually completely destroyed. Discoveries on the Bull Brook site included chert tools, fluted points and 36 house-sized activity areas. 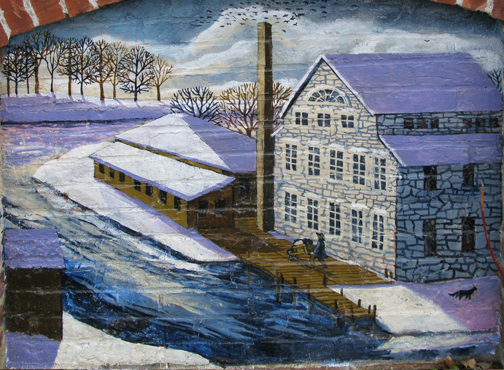 Today the former hosiery mills along the river are owned by EBSCO Publishing. EBSCO is the leading database and eBook provider for libraries and other institutions, with more than 375 full-text and secondary research databases and more than 300,000 eBooks and audio books available via the EBSCO host platform. 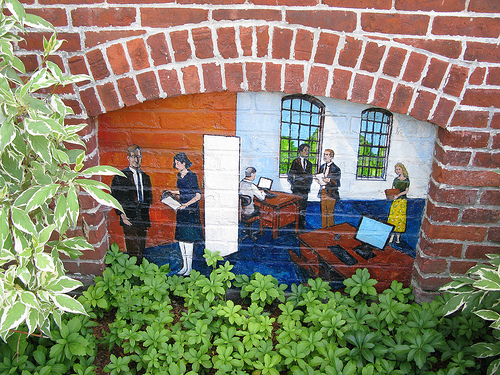 This plaque on the parking lot side of EBSCO Publishing gives credit for the mural to artist Alan Pearsall, EBSCO publishing, the Ipswich Historical Society, and the Ipswich Public Library, as well as Alan’s assistants and the many local people who modeled for the mural. This is awesome. Just wish I’d known about it when I was there. Truly a fabulous mural. 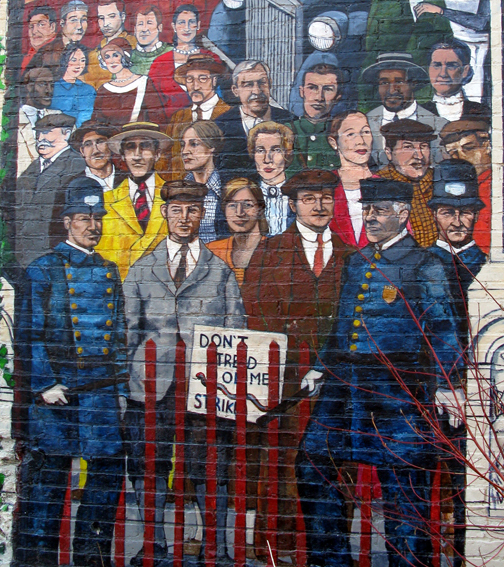 We Here in west orsnge, n.j. would like to use it to inspite our historical,mural got blue historic Main street area.